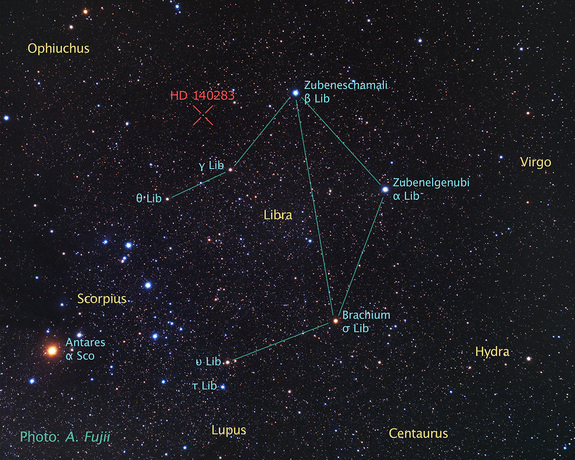 In the constellation Libra about 190 light years away from our planet, reside one of the most mysterious objects in our galaxy, the impossible star which appears to be older than the universe itself. This Methuselah star, cataloged as HD 140283, is a metal poor sub-giant star, neither on the main sequence nor a red giant, has been known to astronomers for more than 100 years as a high-velocity star — it cruises across the sky at a relatively rapid clip. HD 140283 moves through our galactic neighborhood at astonishing speed of 800,000 mph (1.3 million km/h) relative to our solar system; with such speed, its cover the width of the full moon in the sky every 1,500 years or so. This high rate of motion is evidence that the star is just passing through our region of space thus it will eventually rocket back out to our galaxy’s halo — the region of space where the Milky Way’s oldest stars reside. The Methuselah star catch our attention back in 2000 when a team of scientists calculate its age and got a shocking result, the stars appeared to be 16 billion years old, which is more than two billion years older than the universe. This is an absurdity, obviously somebody’s got something wrong here, and it’s almost certainly the age of Methuselah star, not our supposed age of the Universe, which is measured to be 13.78 ± 0.037 billion years old. But here’s a surprise! In 2014, A team of astronomers using NASA’s Hubble Space Telescope refine the distance to HD 140283 and estimated its age: Methuselah star could be as old as (14.5 ± 0.8) billion years, that, barely, gets the star into the realm of being possible — it still older than the universe, which is a dilemma for cosmologists. So, the question is what did we do wrong? Well, there are still many things that we do not know about star formation and their aging process and everyone is confident that HD 140283 is not, in fact, older than the Universe. But what we are pretty sure, the Methuselah star is one of the elder statesmen of the universe. Considering the uncertainty of 800 million years, the star could be as young as 13.6 billion years, which is within the age of the universe. The extreme age of this star is nonetheless fascinating and can tell us many interesting things: it is likely that HD 140283 formed when the universe was less than 170 million years old and it’s a second generation star. The first stars in the universe were the so called population III stars, stars believed to have formed from the primordial “molecular” clouds, 100 million years after the Big Bang. These stars were super-giant stars — 100 to 1,000 times more massive than the Sun, hot and bright, exploding as supernovae after only about 2 million years. Population III stars produced and dispersed the first heavy elements, paving the way for the eventual formation of pop II stars. Methuselah must have been of the second generation of stars, and its age being so close to the birth of the Universe indicates that the space between the formation of the first and second generations of stars was only a few tens of millions of years. Is Methuselah Star the oldest star in the universe? Well, we don’t know but after six months (2014) when the media told us about HD 140283, the “Methuselah Star”, Australian scientists announced the discovery of SMSS J031300.36-670839.3, an easy name to catch, a star at a distance of 6000 light years from Earth, with an age of approximately 13.6 billion years, the oldest star ever seen in the Universe. This latest discovery, of SMSS J031300.36-670839.3, may be the oldest star we know in the universe, but given the uncertainties involved, maybe it isn’t, nobody knows for certain. At this moment, HD 140283 is one of the oldest known stars in the Universe, and while that’s not quite as impressive as being older than the Universe, it’s still a pretty cool superlative.